Pioneering Renewable Energy – and Beyond. Einstein’s Discoveries. Almost everyone is familiar with the impact of Albert Einstein's ground breaking theory of relativity. But our daily lives have been transformed even more by Einstein’s work on how light interacts with matter, explaining fundamentals of the photoelectric effect, for which he received the 1921 Nobel Prize in physics. In fact, Einstein’s discoveries provided fundamental insights into the control of material properties, leading to breakthroughs that ultimately made today’s technological advances possible. The Next Level. More than 100 years later, the Eisele Research Group—a team of young researchers passionate about light-matter interactions—is taking Einstein's theories to the next level. In our laboratories, we are investigating the world at the nanoscale. With our holistic research approach, we aim to gain powerful insights critically needed to confront the countless challenges currently facing humankind: from sustainable energy (e.g. solar energy harvesting) to health care (e.g. drug delivery for cancer treatment). We are Inspired by Nature: Light-matter Interactions at the Nanoscale. Fundamental Research is driven by the desire to gain knowledge and understand nature’s basic processes and has resulted in myriad applications. The Eisele Research Group aims to fundamentally understand, predict, and ultimately control how light interacts with novel, bio-inspired materials at the electronic, atomic, and molecular levels to build the foundations for new energy technologies—and beyond. allowing for chemists and physicists to work hand in hand on the same team, which opens doors to new research avenues, creating unique feedback loops, flows of information, and exchanges of knowledge. The synergistic collaboration between the two research laboratories united within one research group fosters and accelerates pioneering interdisciplinary discoveries. With our laboratories, we are able to study how light interacts with our novel, bio-inspired materials both in time (on an ultrafast time scale) and in space (at a nanoscopic length scale). We are Pioneering Solar Energy Harvesting. Instead of improving the efficiency of current photovoltaic devices (solar cells), the goal of our research is to learn from nature’s design principles in order to inspire creation of entirely new photovoltaic architectures that can operate both efficiently and robustly. A key to our ability to mimic nature’s photosynthetic complexes and to tune materials properties for efficient artificial solar energy harvesting applications is a fundamental understanding of the basic light-harvesting processes. In our laboratories, we are designing new materials (model systems) to elucidate the fundamental processes that govern nature’s highly efficient photosynthetic organisms. 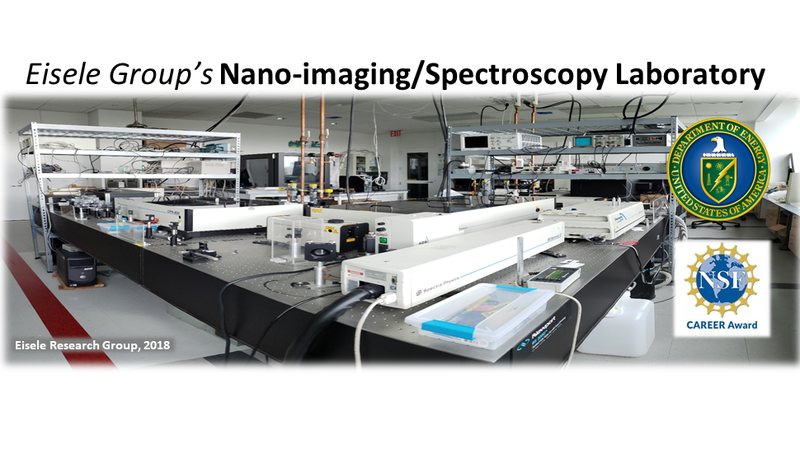 In particular, understanding the fundamentals of excitation energy transfer (EET) and electron transport (ET) processes in nanoscale systems is vital to making new breakthroughs in the development of opto-electronic applications such as photovoltaic devices. Our ultimate goal is to develop new light-harvesting materials that replicate the superior efficiency and robustness of biological light-harvesting systems. These new nanomaterials may also have broad applications in nanotechnology – in drug delivery nanoparticles, components in molecular electronics, quantum computers, and field-effect transistors. In this way, our research contributes to the foundational knowledge needed for the transformation to a clean energy economy—and beyond. We are Pioneering Health Care. Our body is made up of cells. The cell’s membrane performs various functions for the cell’s life processes. Therefore, any future progress in current healthcare challenges to fight life-threatening illnesses—like cancer or viral diseases—will require an improved understanding of the underlying fundamental processes such as membrane fusion. In our group, we synthesize artificial supramolecular nanostructures that replicate important processes involved in membrane fusion, which allows us to directly investigate the factors that participate in regulating this process. Knowing how to regulate membrane fusion would give way to countless medical applications from facilitating fertilization, to boosting the body’s nutrient intake, to protecting against viruses—and beyond. Moreover, in our laboratories, we synthesize novel hybrid nanomaterials by combining metal nanoparticles with polymer nanoparticles as well as supramolecular nanostructures. Manipulating nanomaterials requires extremely high precision. To accomplish this, we employ microfluidics, which is a technique that carries out chemical reactions with volumes as small as nano- and picoliters. With our work, we aim to push the boundaries of the field of microfuidics, and create completely new and exciting nanomaterials: the hybrid nature of our resulting nanocomposites gives rise to unique physical properties that can potentially be utilized in fields such as smart drug delivery, regeneration, and solar power—and beyond. Materials Synthesis in Our Chemistry Laboratories. We create well-defined model systems in solution and on solid substrates. Our preparation methods include microfluidic techniques using low pressure syringe pumps from CETONI GmbH. We are fascinated by the collective phenomena found in self-assembled nanoscale systems such as supra-molecular assemblies (Frenkel exciton systems), semiconductor nanostructures (Wannier exciton systems), metallic nanostructures (plasmonic systems), and the organic/inorganic hybrid materials derived from these nanosystems including novel polymer nanoparticles and peptides.